There is no reason why you should not try it out, and this is exactly how you can use Quora for generating leads. Quora is a community of people asking questions and providing answers, founded by an ex Facebook employee Adam D’Angelo. 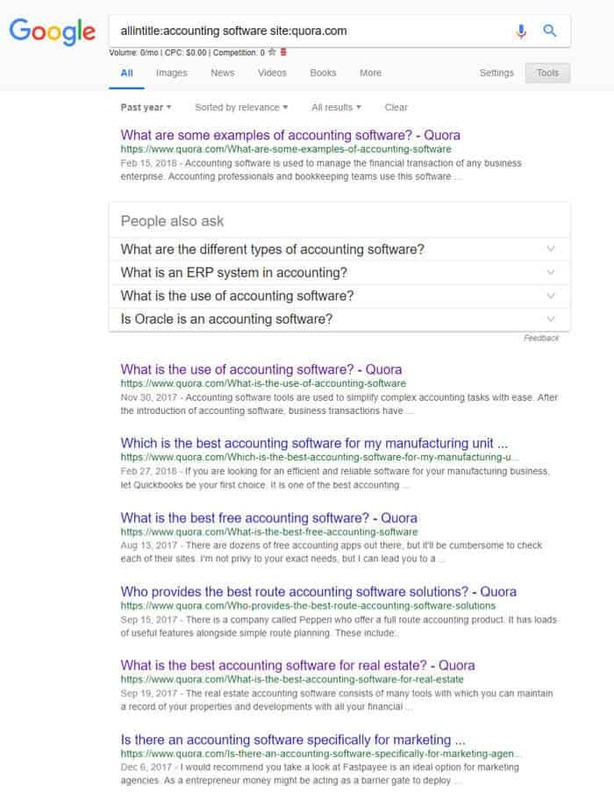 Unlike similar Q & A platforms, like Reddit and Yahoo answers, Quora is more personal as people use their real name and provide credentials for their expertise, such as job titles and education history. How to generate leads with Quora? The beauty of Quora lead generation is that there are multiple ways you can interact with and find leads for different stages of the funnel. So let’s dive deeper into these individual strategies. Let’s say we are developing accounting software, so we need to find clients interested in this type of SaaS. For this strategy we will be using Google search operators. These handy search modifications allow us to refine our search and to quickly find what we need. Our keywords will be accounting software. Say hello to these two search operators. So, how does this look in practice? Once we get a list of questions we need to find the one with appropriate user intent, and that would be one which indicates the intention to buy a software. This brings users to the bottom of the funnel. and other types of questions comparing different solutions. Once we identify the question we think it’s the most suited let’s click on it and see what we get. Look at the number of followers right below the headline. 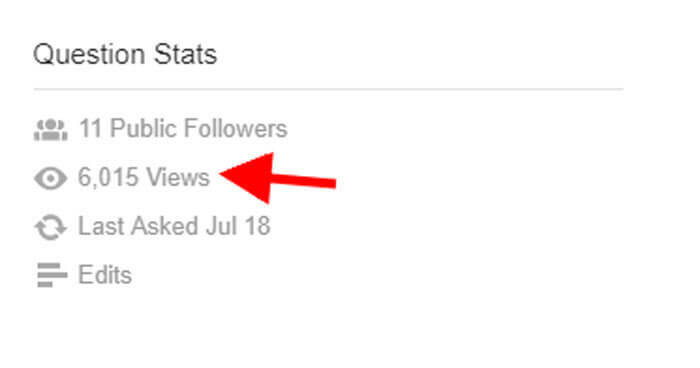 This number is important because it indicates the number of people looking for an answer (followers). These are the potential leads. You should ignore people who answered the question because they are the people who are probably offering a solution themselves, or have used different solutions in the past and they want to share their experience. If the number of followers is really low, or there are none, skip that question. If the number looks ok, you need to find out who those people are. 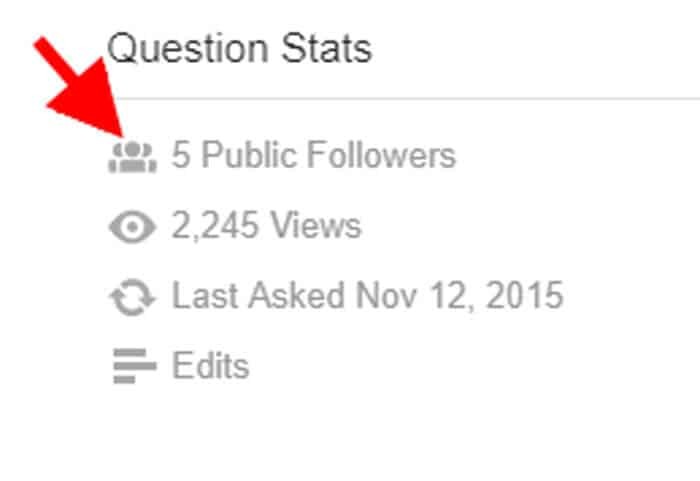 Look for the question stats in the right sidebar, below related questions. Once you click on the icon a popup will appear with Quora profiles who are following this question. Having their name does not provide enough information, the more info you have about your prospect the easier is to make the sale. People usually don’t give out as much personal info on Quora as they would on some other social media networks, so we need to play Catfish and look them up. Back to our friends, search operators. In order for this to work, there has to be at least some other info besides their name. It’s usually a company they work for or a University they graduated from. The most credible social platform is LinkedIn, so that is where we will look at our potential leads. An easy way to find someone on LinkedIn is straight through Google, using search operators. 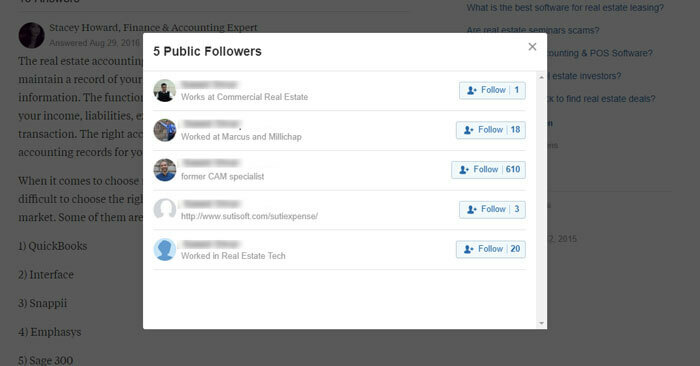 Once you confirmed their identity on LinkedIn you could reach them on the platform or you can find out their contact with these email Linkedin tools. The issue with this strategy is you don’t know at which point in time someone followed the questions and whether they already found a solution or not. But if you believe your product is better than everything else on the market, there is no reason not to reach out to them. There are many ways you can interact with your customers and build trust. Whether it be Facebook, Twitter, Email or your Blog. Quora is different in the way users interact with its content. Unlike Facebook or Twitter where people usually spend their leisure time, when visit Quora people are looking for one thing only – answers. So you have people who actually want to find out what someone has to say. Your task is to become that someone. People respect and admire (even worship) experts in their field. That’s why athletes, singers, actors, etc. have such large fan bases. When you are really good at something people will be naturally attracted to you. The same logic applies to Quora. This strategy is about establishing yourself as an expert and acquiring a large following. There are many aspects of this Quora marketing strategy which exceed the frame of this post. In the process of establishing yourself as an expert you will provide valuable information (answers) on topics regarding your industry. If your answers provide actual value people will start to notice and follow you. They will check your profile and look for your company website and ultimately seek your service since you have built enough trust for them to believe your product is the best solution. Building trust is the biggest potential of Quora B2B lead generation. For a more detailed approach for building your Quora presence you can check this guide. The most potent lead generation channel are organic visits to your website. To get visitors to your website directly from search engines you need to have an SEO strategy. The foundation of any SEO strategy is content. And in order to create content, you need to know what type of content your customers need. This is where keyword research steps in. 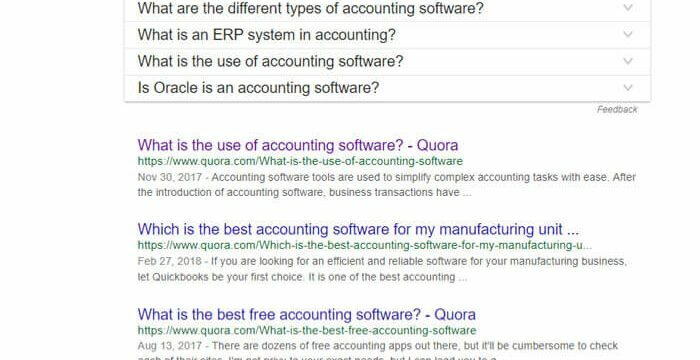 There are many tools for doing keyword research and one trick is to use Quora. You can use Quora for creating content by looking at the most popular questions. Enter your topic in the search bar and choose the mark topic. Now look at the questions and open them so you can check the stats. If the question has a lot of views search that topic on Google. If there are no blog posts on that topic that means you have a high chance for getting the first result for that keyword. 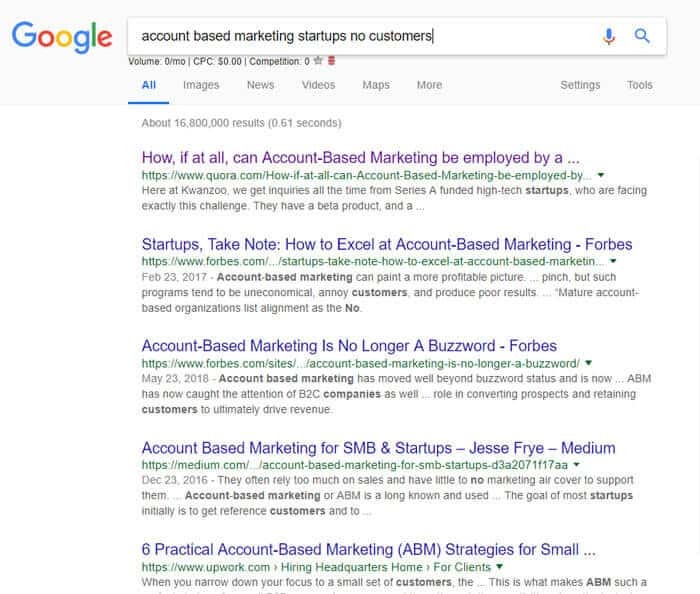 In my example I searched for the term Account Based Marketing. When I clicked on the first topic I saw there are over 6.000 views, so I can assume people are interested in this topic. Let’s check what Google offers for this term. I shortened the term, but Google is smart enough to understand what I want, so I am sure if there were blogs on this topic they would have showed up. 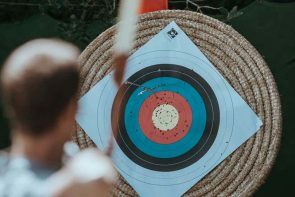 You can see there are blogs about Account Based Marketing, but neither one is talking about specifically about our topic. And we saw that people are interested in it. So that would be a great blog post idea. Usually, you would have to make the title more SEO friendly, and expand on the topic with more research and insight. You could automate this process with Buzzsumo. 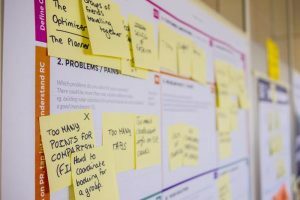 This tool can aggregate questions from sites like Reddit and Quora so you can quickly sift through various questions and find topics for your blog. Brian Dean made an excellent Buzzsumo guide which you need to check out if you want to start using this great tool. 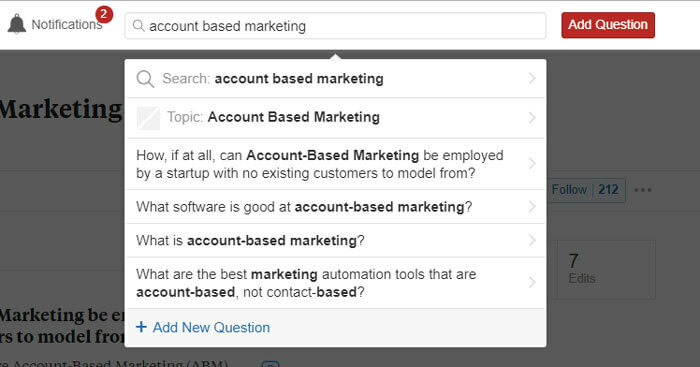 Start testing Quora for B2B lead gen now! As you can see, Quora can be used in many ways as a lead generation channel. The success with it will vary on many factors, such as your industry and the time and resources you spend on it. Quora marketing is not a quick fix. You need to have a plan and be consistent, it’s not set-it-and-forget-it type of thing. But don’t let that discourage you from at least trying it out. There are many ways to generate leads. At Market Republic we are focused on getting the biggest ROI for your budget. Our outbound lead generation service is tailor-made for every client and its effectiveness is reflected in our client’s growth.